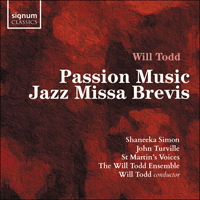 Commissioned for the choirs of St Martin-in-the-Fields, London, in 2018, Passion Music continues the fusion of jazz and choral music so successfully blended in Will Todd’s Mass in Blue. The structure highlights different points in the Passion story, beginning with a new setting of ‘Greater love has no man’ and including an evocative Stabat mater, a movement focusing on the seven last words of Christ, and a setting of ‘Were you there when they crucified my Lord?’. While some sections are reflective, Todd also makes full use of his understanding of energetic jazz and gospel. The vocal soloist is given plenty of expressive freedom, singing both with the choir and independently to achieve the characteristic jazz-soul style. The seven-piece jazz accompaniment provides a background at times intimate and spellbinding, at others driving and sensual. Will Todd directed the premiere at St Martin's in March 2018 with Shaneeka Simon, John Turville, the Will Todd Ensemble and combined choirs of St Martin-in-the-Fields. The work received its US premiere in February 2019 at the American Choral Directors Association International Conference in Kansas City. Commissioned by David Price for Portsmouth Cathedral with funds from The Groves Legacy, Will Todd’s Jazz Missa Brevis gives new life to the sung Latin Mass texts in an accessible, short setting which embraces a variety of jazz styles, from the swinging jazz waltz Kyrie to the up-beat Latin-groove Gloria. The smooth jazz ballad Sanctus, 7/8 Benedictus and soulful Agnus Dei complete this inspiring Mass setting. Underpinned by Todd’s characteristic jazz harmonies and melodic craftsmanship, it is suitable for performance both liturgically and as part of a concert by mixed choirs of all abilities. Performed here by the St Martin’s Voices and Will Todd Ensemble, the work can also be accompanied by piano alone (as written or extemporised) or jazz trio (piano, bass and drums). Included on this disc are four separate a cappella settings: God So Loved The World, I Am Changed, Tantum Ergo and What Sweeter Music. These are all recent commissions, written for choirs in the UK. God So Loved the World was commissioned for the choirs at Oakham School and is a soft, yearning setting for divisi voices. I Am Changed was written for the John Lewis Choir in 2016 with a text of my own; it follows a similar structure to my well-known carol My Lord Has Come, although this piece is in seven parts. Tantum Ergo was commissioned by St Michael’s Church in Edinburgh and is a simple four-part setting of this well-known Latin text. Finally, What Sweeter Music sets words by Robert Herrick and was commissioned by Dundee University Choir in 2015.